Always wear underwear in public, especially when working under your vehicle. 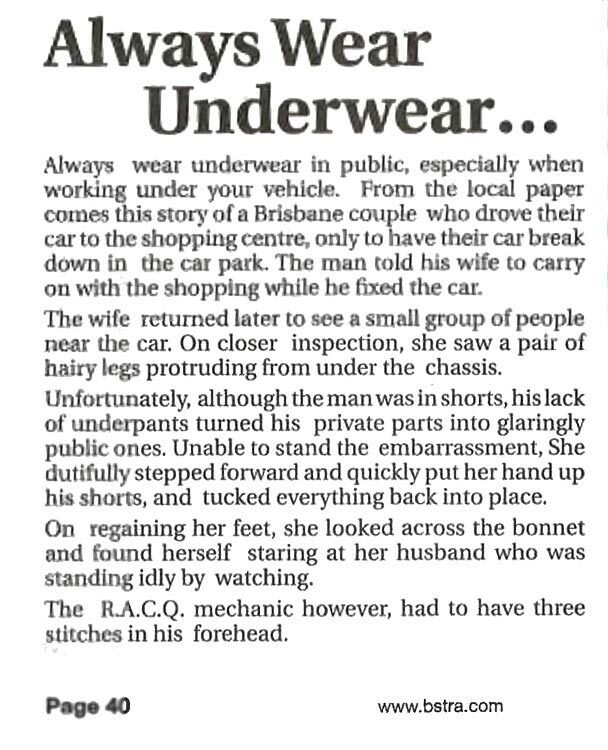 From the local paper comes this story of a Brisbane couple who drove their car to the shopping centre, only to have their car break down in the car park. The man told his wife to carry on with the shopping while he fixed the car. The wife returned later to see a small group of people near the car. On closer inspection, she saw a pair of hairy legs protruding from under the chassis. Unfortunately, although the man was in shorts, his lack of underpants turned his private parts into glaringly public ones. Unable to stand the embarrassment, she dutifully stepped forward and quickly put her hand up his shorts, and tucked everything back into place. On regaining her feet, she looked across the bonnet and found herself staring at her husband who was standing idly by watching. The RACQ mechanic however, had to have three stitches in his forehead. Created about 6 yrs, 9 days ago (April 14, 2013). Updated about 6 yrs, 9 days ago (April 14, 2013).